You would know that industrial fasteners are important for many industries. They serve many important functions. You might also be aware that heat treatments become necessary for fasteners. We at Indana Steel are one of the leading manufacturers and suppliers of fasteners .through this blog we will provide you with certain tips in regard to heat treatments of fasteners. What the heat treatment processes for fasteners involve? The heat treatment process involves the heating and cooling operations which are applied on alloys or metals in the solid state of matter. Through this the fasteners are first subjected to the application of heat. This is done to achieve the desired alteration in rigidity, smoothness malleability and material strength. The chemistry of the element which is being heated plays an important role in the heat treatment process. The same applies for fasteners also. So while whatever be the metal or alloy which is being heated you need to know the exact chemical composition and the details in regard to how it would react to the heat and what are the safeguards you need to take to make the process yield the desired results. 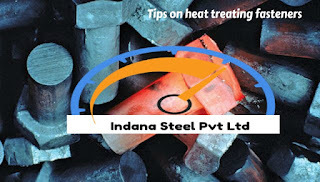 It is true that heat treatment process tolerates the damp parts. However there is no logical reason why you should not pay attention to the cleaning and drying of the parts. All you need to do is just to move the dirt from the surface of the parts to the disposal system. The removal of dampness and dirt helps in the whole heating process make it more effective. In the process you need to ensure that there is no damage to the thread due to mishandling. Improper use of metal rod or clearing the jams can often cause damage to the threads which are irreversible and thus must be avoided. The ultra design planner very huge project. major views is indoor and outdoor glass design work Using Pipe Threading To Finish the job.